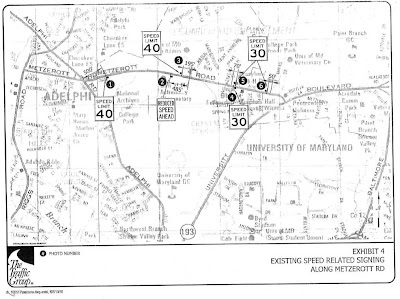 In December 2010 we reported that the speed limit had recently been lowered at a lucrative College Park speed camera site on the portion of East-bound Metzerott Road, using current photos compared to Google Street View images. After our inquiry to the city received no response for one month, StopBigBrotherMD.org followed up on that with a formal Maryland Public Information Act request to the city. On Jan 28th the city responded to our request by turning over documents which appear to show that the exact speed limit change we had stated in our original story had in fact taken place, while at the same time stating that there was no speed limit change. Our request letter asked for, among other things "Any correspondence, letters, emails, memos, or other documents, pertaining to changing or adding new speed limit signs or speed limit warning signs on Metzerott Road. This includes records dated from 10/1/2009 to present. This includes correspondence between city officials, or between College Park and Maryland State or Prince George's County government agencies." 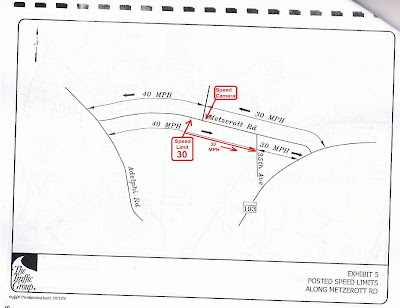 The response letter from the city clerk stated "Note that all required speed limit signs were already in place on Metzerott Road prior to installation of the speed camera. Additional signs were added to enhance notification of the enforcement zone. There were no changes in the speed limit." However we note that our request was for correspondence since 10/01/2009... and our story and request never claimed the speed limit was changed after the camera was deployed, and our assertion was that the speed limit changed immediately before the camera was deployed. 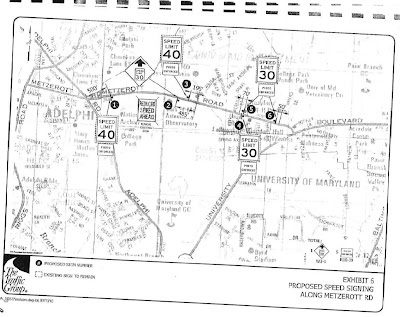 Among the documents the city released was a request to the Prince George's County DPW to approve the use speed cameras in College Park, which you can see here. 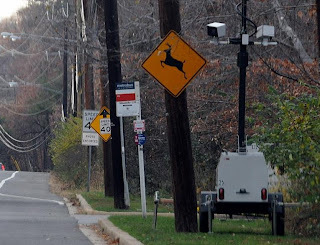 The document was prepared by "The Traffic Group" (coincidentally the same company which prepared a similar request for the town of Brentwood which proved the speed limits at that town's camera site had been lowered last year) and was dated July 21, 2010. 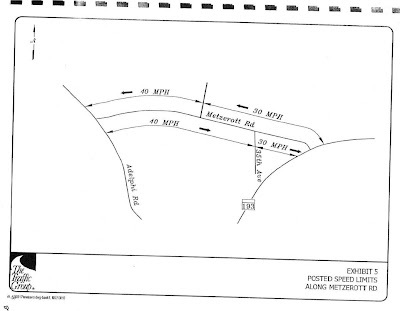 It included the following diagram, showing the pre-existing speed limit signage on Metzerott. 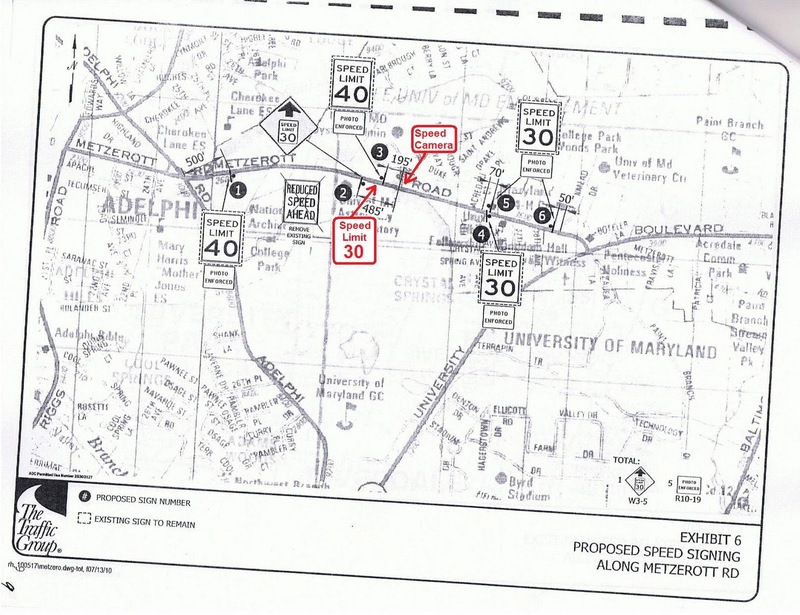 A second diagram shows the "Posted Speed Limits Along Metzerott Rd" zones. 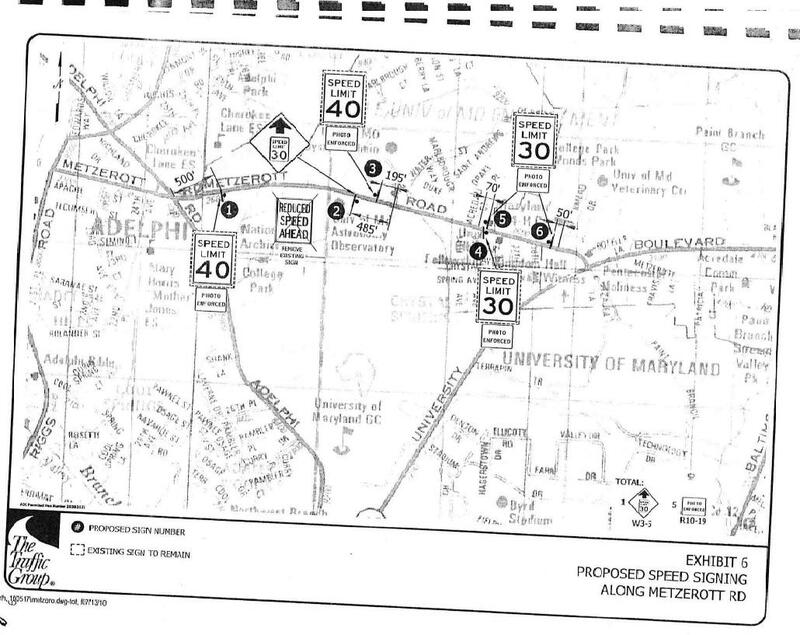 Notice that is specifically shows the 40mph zone extending to 35th street. 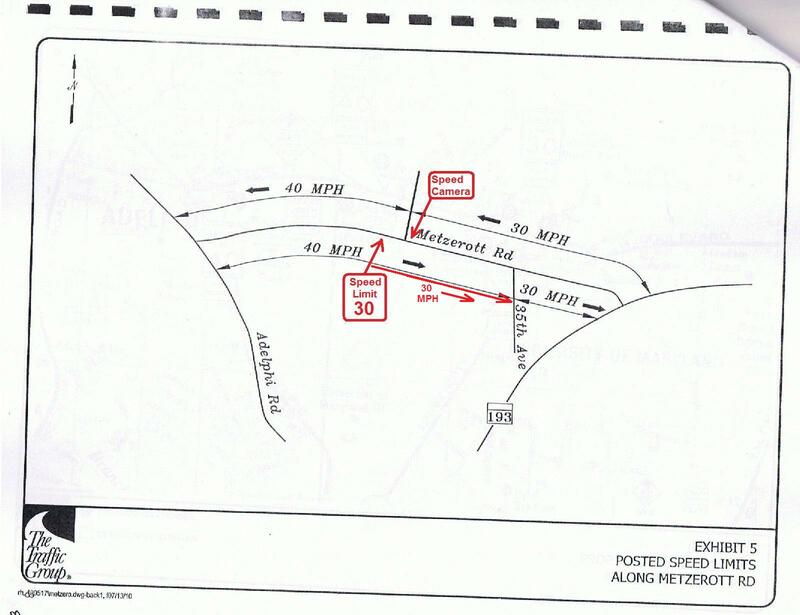 And, it included a third diagram showing the "Proposed Speed Signage Along Metzerott Road". The signs are the same as the signs before the change. Unfortunately, this is NOT how the speed limits are currently marked. 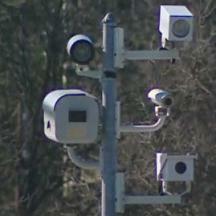 There is in fact a camera at the 3200 block which most certainly is enforcing a 30mph speed limit in both directions. We have annotated those locations in RED. And here is a picture of this nonexistent speed limit sign, marking the spot where the speed limit now changes from 40 to 30. Well perhaps the diagrams in the permit request were simply in error? All three of them. 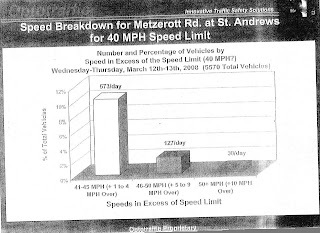 However the documents turned over by the city ALSO included a presentation by Optotraffic, which showed the results of that company's traffic survey at the intersection of Metzerott Rd and St Andrews Streets, which is to the east of the current camera location and west of the old start of the 30mph zone at 35th street. That presentation clearly stated that it was based on a 40mph speed limit at this point. The results of the survey in the presentation showed that the number of vehicles traveling 50+ mph or higher (stated as "+10mph Over") was 38/day, the number traveling 46-50mph over (stated at 5-9mph over) was 127/day, and at 41-45mph over the limit it 573/day (out of 5570 total vehicles in a 2 day survey). That works out to 738 total traveling over the 40mph limit (13.2%), but less than 38 of them (0.68%) would be traveling at a speed which a speed camera ticket could legally be issued. HOWEVER if the speed limit was 30mph suddenly 13.2% of vehicles would be traveling 11mph or more over, and most of them would now be eligible for speed camera tickets. 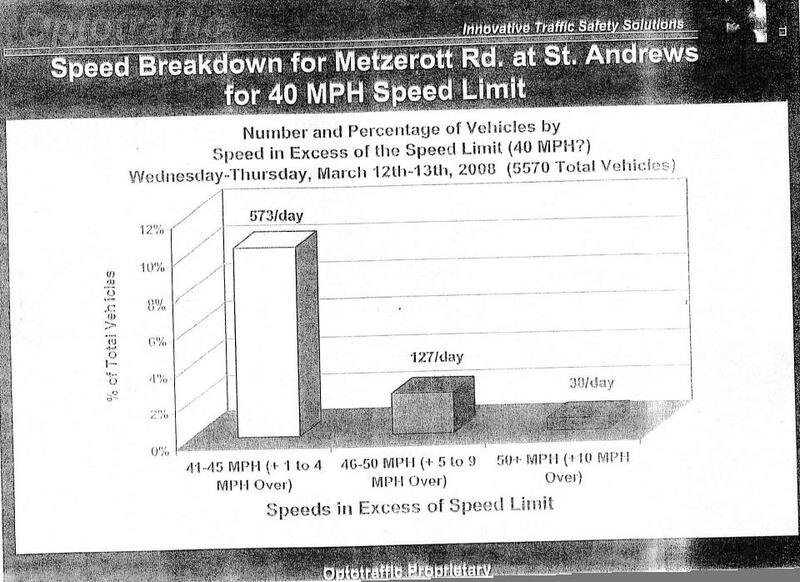 The Optotraffic presentation concluded that "Speeding is a small problem on Metzerott Rd and St Andrews" and followed "although the speed limit of 40MPH appears to be improper for a residential area", which could be construed as a recommendation to change it. The city also turned over a copy of their speed camera contract, which shows that Optotraffic is receiving a 39% cut of every citation. One specific issue with contingent fee contracts (a practice which was *supposed* to be banned under Maryland law but which has been successfully circumvented by most local governments using semantic tricks) is that below a certain number of violations, the camera company would loose money. At less than 38 violations per day, a number which would drop as the camera location became known, Optotraffic would make no money. But by placing this mobile camera site in a 30mph zone, just 100 yards or so after the drop in the speed limit (the actual location is farther to the west than the location in the survey), the site produces substantial revenue for both the contractor and the city. This single camera issued over 8000 citations in less than one month. Additionally, when traveling in the Westbound direction, the camera enforcing the 30mph limit is now so close to the end of the 30mph zone that the drivers are clearly facing TWO signs that say "Speed Limit 40mph:. We were going to show you one last piece of evidence which we had withheld from our previous report (just in case). On the back of the newly installed 30mph sign near the 3200 block eastbound, there are installation date stickers on both the "Photo Enforced" and "Speed Limit 30 signs" at eastbound 3100 Metzerott Rd showing a date of 11/2010. 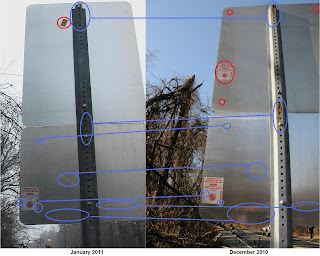 The stickers show both signs were installed by the College Park DPW. This photo was taken on December 9th, 2010, just before we posted our story and contacted the city about the matter. HOWEVER we returned to the site on February 5th to take additional photos. Low and behold, the sticker is gone, and replaced with a little yellow sticker dated 01/2011. That sticker does not show who it was installed by, but it appears to be a Prince George's County issued sticker. 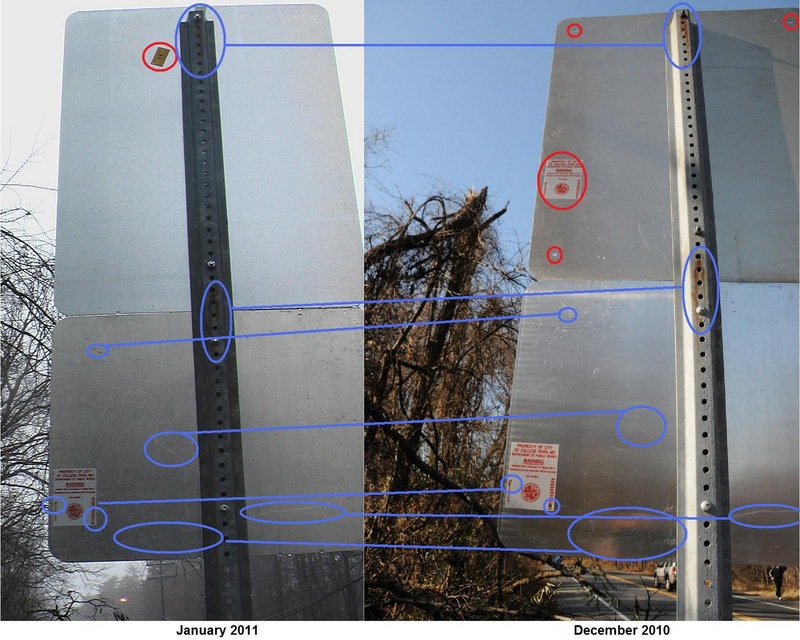 Notice the specific scratch marks circled in blue on the back of the photo enforced (bottom) sign are the same, the bottom sticker is in the exact same place, and rust marks on the pole are the same. However while the bottom sign matches exactly, in fact the SIGN(not just the sticker) on the top is a different one, the old sign had screw holes on each corner. Sometime in January 2011 (coincidentally the same time our MPIA request was being processed) the speed limit sign was replaced by a new one in the same spot. Apparently someone (PG County DPW most likely) came and replaced the 30mph sign which was there in December with a different 30mph sign between Dec 9th and Feb 5th. Why on earth? 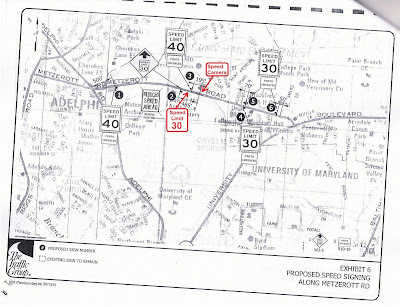 It was noted that at the time the first photo was taken, the other speed limit signs in the area all had yellow stickers similar to the ones now on the 30mph sign, rather than the white college park stickers, and showed the year as '95. 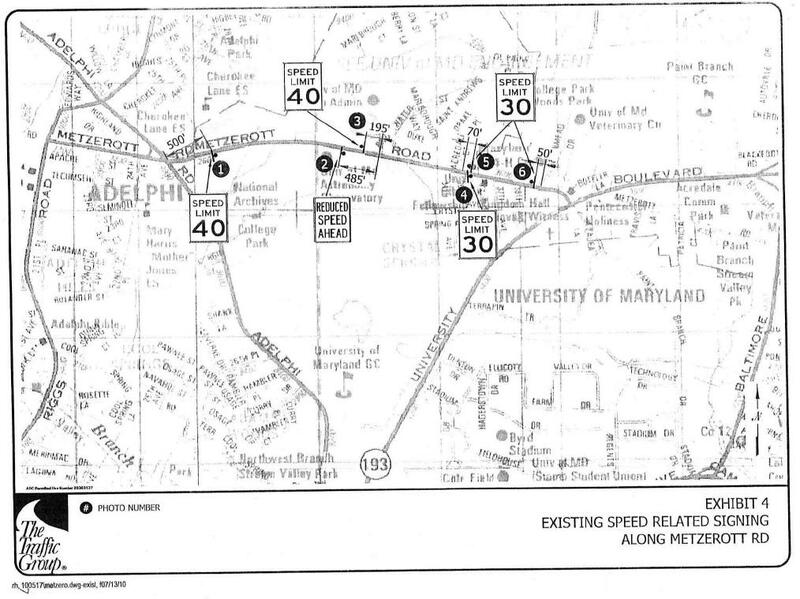 So we will venture a guess: because Metzerott Road is a County owned road, that the County is responsible for posting speed limits and and that College Park (after the fact) arranged for the County to go back and replace the 30mph sign with a new, county issued one which was 'up to code'. Well that's our theory anyways. 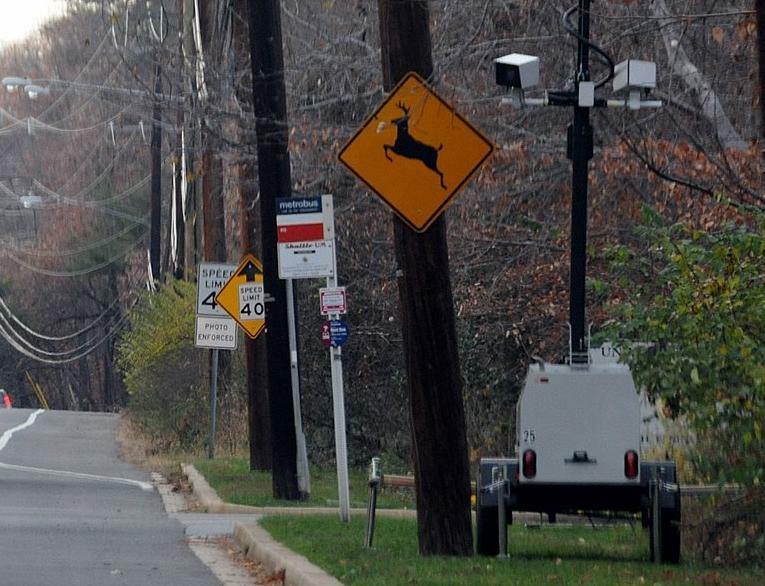 The bottom line is that the current camera configuration creates a very lucrative situation for College Park and their contractor by having a camera placed immediately at a speed transition zone. We will concede that there are legitimate reasons for lowering speed limits in some places and some times, and it certainly is possible that the old configuration was the result of a sign being torn town long ago for an extended period of time (long enough for it to be missed both in the StreetView images and in the city's traffic survey and report). But one might ask why, if this change (compared to their own records) was made and this sign added 'for safety', city officials don't wish to simply admit that it happened? And even if we were to grant that there might have been some confusion with the signage in this location for the individuals who did the city's report and study, if traffic engineers thought this was a 40mph zone, what on earth would they expect drivers to think? If it was a temporary problem with the signage, one large enough to confuse their own engineers, would it not have been more appropriate to fix the signage first and then conduct their traffic survey before deciding to place cameras, both to see whether it was genuinely 'necessary' and so as to be able to compare 'apples to apples' after the cameras went up?